The name Aurangabad comes from an ancient emperor from Mughal named Aurangzeb Aurangabad. While the city wasn’t officially founded until 1610, it’s one of the main four important cities today of Maharashtra. While the city has undergone drastic changes in the last few decades, particularly in the industrial boom and the rapid growth of the city, Aurangabad hasn’t strayed away from their cultural heritage and traditions that founded the city. Tourists love going to this city for some of the historical attractions and tourist attractions. There’s a lot of different historical monuments to explore and there’s the Ajanta Caves and the Ellora Caves as well. These two caves are listed under UNESCO as World Heritage Sites. 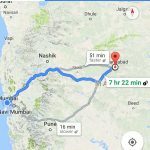 Travelling to Aurangabad is ideally done from Mumbai because of the travelling distance, the route taken there and for any of the cities that may be close by to Aurangabad that you may also want to visit. It’s a land full of cultural heritage, traditions and plenty of tourist attractions that you’ll want to explore. 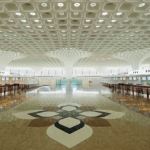 There are three different primary routes for travelling from Mumbai to Aurangabad. 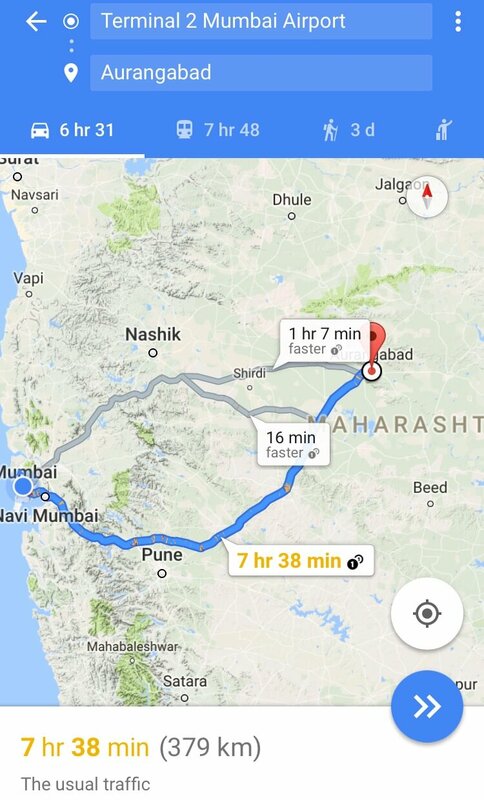 The quickest route is going through NH160 to Ghoti – Shirdi Rd and Nagpur to arrive to your destination. This takes an approximate 6 hours and 1 minutes and covers a distance of 335 km. 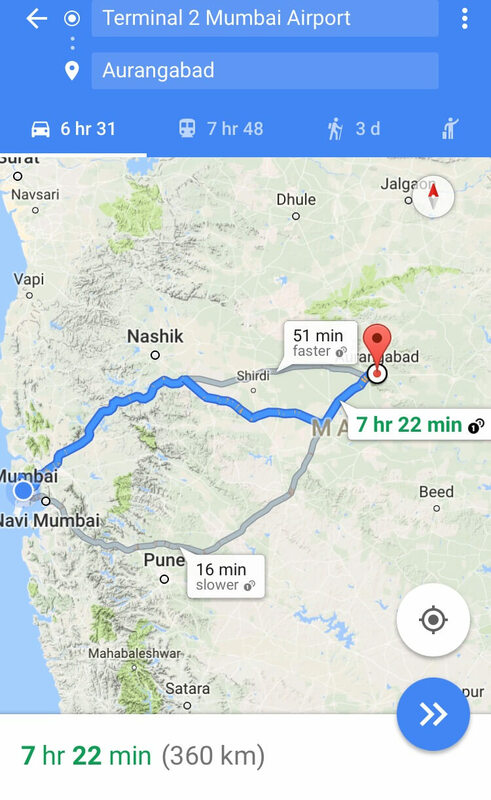 The second route follows NH160 and will travel an approximate distance of 360 km which will take nearly 7 hours or 6 hours and 50 minutes estimated by Google Maps. The final route is going through Bangalore – Mumbai Highway. 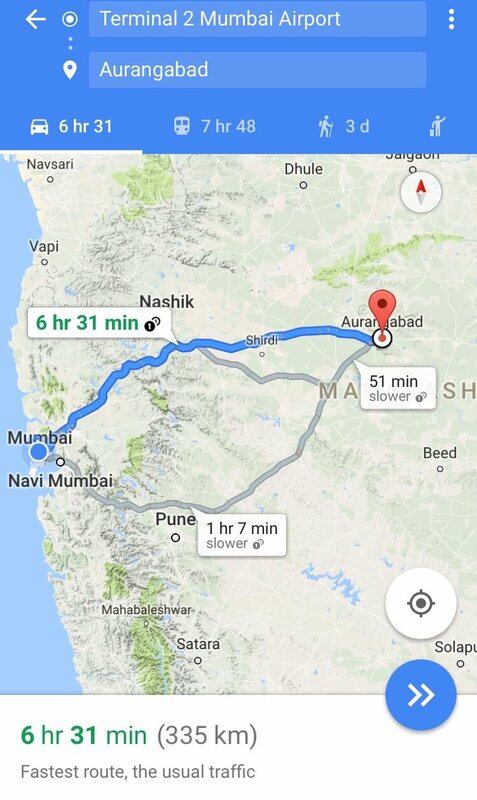 You’ll then end up going through Mumbai Highway, to Mumbai Pune Highway and finally to Aurangabad on a flat highway. The approximate travel time here is a couple of minutes longer than the above travel method at 6 hours and 52 minutes and 370 km. When choosing a travelling method or which vehicle you’d like to use for your travel destination, you have to take a few different things into account. The amount of people you plan on bringing for the trip. Some vehicles only have a 4 person capacity and a few vehicles have a 6 person capacity. This isn’t including the driver, so take that into account when figuring out how many seats you’re going to need. The fare pricing is going to be drastically different depending on the kind of vehicle you take. Some of the cars featured are luxury vehicles with a lot of different features and comfort options available for you while some are economy friendly and don’t have nearly the amount of features as the others at the expensive of a lower cost. How much luggage you have is another thing to take into account because the cheapest option will only hold about 4 bags of luggage with boot space. Most people travelling from Mumbai to Aurangabad don’t carry nearly that much luggage but it’s something to take into consideration. There are 7 different primary methods of transportation available here at Carjee. We offer the most luxurious transportation methods at the lowest prices. We want our customers to relax and be comfortable on their journey, because it’s a long ride. First, we have the Swift Dzire AC. This is classified as a mid-sized vehicle and it’s highly comfortable. It’s a four seater, so take that into account when figuring out the seating arrangements. It will only hold about 4 bags of boot space, so don’t choose this option if you have a lot of carry-on items. Next, we have the Toyota Etios AC which is another mid-sized vehicle and seats four people. This vehicle is equipped with a powerful AC and is a great vehicle from Toyota. This is an upgrade from the mid-sized vehicle and is classified as a SUV. This is one of the lowest priced vehicle options available for people looking for a 6 seater and a bit more bag space. This is the best budget-friendly option available for outstation travelers with more than 4 people. This is a semi luxury vehicle from the Toyota lineup and seats 6 people. It’s a little more expensive than the Toyota Innova AC but comes with some nice luxury options and has great leg room for passengers. While this only seats four people, this is the first luxury car on the line up with a lot of unique features and a lot of upgrades compared to the previous vehicles. This is the best luxury vehicle with budget friendly rates. One of the only non-Toyota vehicles comes in as one of the best options on our list but it’s not the most budget friendly. It’s a Honda Accord AC and it’s an amazing luxury car with a lot of great features from the Honda brand. It only seats four people though. There are plenty of sights and attractions to see in Aurangabad. The locals are very friendly to tourists and will help you out along the way if you ever need suggestions on what to do or what to go see. This is one of the most beautiful scenes you will find in Aurangabad. When you come from Mumbai to Aurangabad, you’ll definitely want to put this on your list. There are 14 different Buddhist caves with one section of caves having 10 different caves and the second section having the remaining four. There’s plenty of amazing old sculptures and architecture there that are sure to blow your mind. This location is only half a km from the Ellora Caves and it’s definitely worth a visit. You’ll be amazed by the amazing art and architecture at the temple here. It’s awe-inspiring and it’s something you can’t miss. There are twelve Siva temples and this is one of the most beautiful out of all of them. There’s a beautiful garden that has a lot of frequent tourist visitors and it was created for someone named Bani Begum, which was the wife of Aurangazeb’s grandson. A lot of tourists experience inner peace here and come for the breath-taking peaceful scene. If you find yourself in the village of Daulat or want to explore it, you’ll want to check out this massive fort. This fort was actually constructed as early as 1187 A.D.. One of the most fascinating aspects of the fort is that during their prime, no one had managed to conquer this fort and it was impenetrable. No one had ever won the fort over due to the architecture and location of the fort. This list wouldn’t be complete without the famous Ellora Caves of Aurangabad. There are 34 different caves that represent three different religions here; Buddhism, Jainism and Hinduism. The amount of detail in the architecture and carvings of the caves still have some archaeologists baffled. Finally, we have the Ajanta Caves, which is considered the #1 tourist attraction of all Aurangabad tourists. One thing that baffles researchers is the paintings inside these caves which have stood the test of time and look like they were freshly done. The painting styles exhibited here are unique and this is a MUST see for any tourist in Aurangabad. Why Choose a Car Rental? Car rentals can be convenient and for a lot of different reasons. We’ll go over some of the top reasons as to why you should choose a rental over different options. #1 – Flights can be rather expensive and it may not get you to your destination quicker. There’s the airport delays and other various things that can go wrong to delay your travelling time. #2 – The car rental experts at Carjee know the lands inside and out. They can help recommend places to stay, places to visit and things you should do during your stay. #3 – Car rental drivers are professionals. 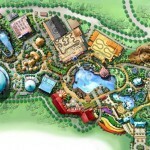 They strive on providing friendly customer service and making sure you have a great vacation. They’ll also ensure that you get to your destination as quickly as possible.